MetaTrader 5 is a powerful and resourceful platform that any binary option trader might consider using to improve their market analysis. Most binary option brokers will only offer very basic information. Typically, only the price of the asset being traded along with a simple line chart is what is provided on their platforms. This is not enough information for a trader to make a knowledgeable decision with. 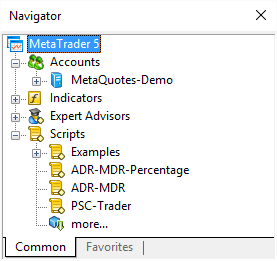 MetaTrader 5, or MT5 as many traders refer to it, provides various tools to perform both technical and fundamental analysis with. It also has real time price quotes for all of the major financial instruments, a Strategy Tester application, copy trading, trading signals, and a charting suite that is full of extremely useful indicators. Using MT5 to trade binary options will give a trader an advantage and will help make better trades. 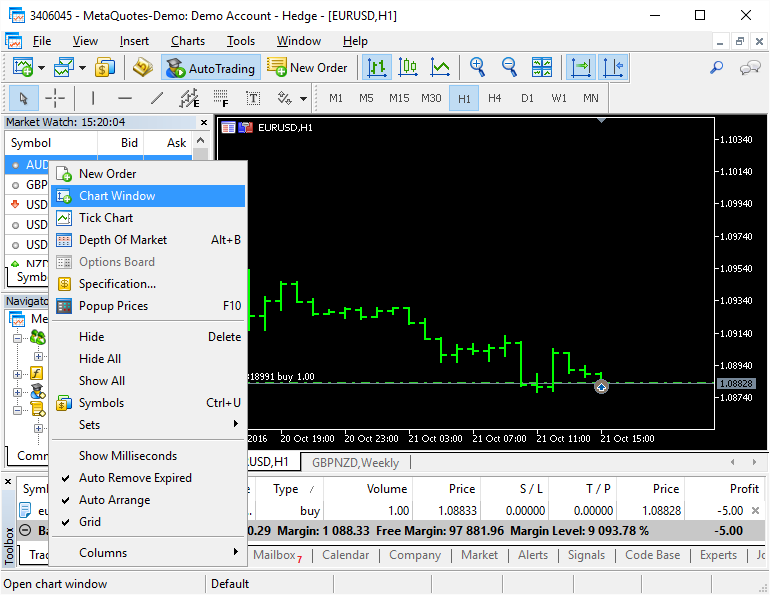 To begin using MetaTrader 5, simply go to their website and download the client software. It is free and the installation process is very straightforward. MT5 is available on iOS, Android, and PC devices, though their mobile versions are not as powerful as the Windows MT5. They also offer an entirely web-based platform that requires no installation. Once MT5 is installed on your device, you can choose to test out the service with a demo account. This is great for binary traders who want to see what the system is all about without investing any money to start. MT5 has a lot of different features and the interface may seem overwhelming at first. To help reduce this learning curve, the next section of this article will break down the different parts of the user interface so that you can begin utilizing all the tools that this platform has to offer. As you can see, the first window in the upper left is labeled “Market Watch”. You can view a closeup picture of this window below. This is a quick way to see information on various financial instruments of your choosing. The list gives you the ability to add or delete the financial symbols you want to follow, provides the options to view the latest bid/ask prices, and gives you the ability to view a tick chart. This is a very fast and convenient way to look up prices on the different instruments that you are specifically following. Next, there is another window labeled “Navigator”. Here is where you can quickly access many important and useful features such as different accounts, trading indicators, expert advisors, and scripts. Take a look at the picture below. The accounts section allows you to effortlessly switch between the different trading accounts you may have. 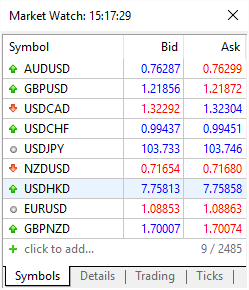 The indicators sections allows you to view a variety of different indicators and easily apply them. To do this, simply click on the indicator you want to apply and drag it onto whatever chart of you select. The expert advisor is what MT5 calls their trading robots. This allows for fully automated trading and the ability to customize when you want to sell or trade without being at the computer. The last tab is labeled “Scripts”. This is where you can apply or perform many different functions to a chart. From deciding when to close a position to graphing a histogram chart for a given asset, scripts can be written for almost any action you want to perform. All of these features provide huge advantages for a trader and should be used to help form a trading strategy of any kind. But no trading strategy is complete without proper technical analysis. That is why the majority of MT5’s interface is reserved for displaying charts. 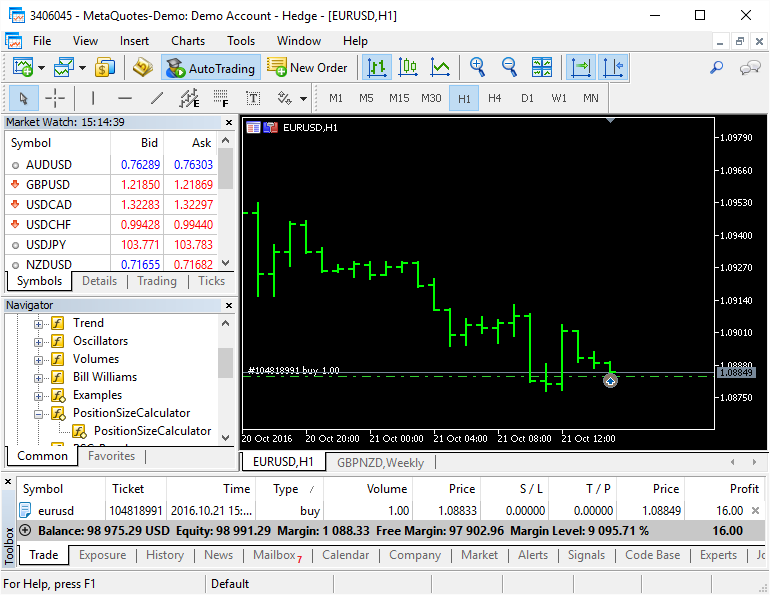 MetaTrader 5 is really an all-in-one technical analysis platform. The charting suite has all the utilities and features you would expect from a top charting platform. Users have the ability to open over 100 charts at a single time, 21 different timeframes to choose from, and over 80 standard indicators that all come built into the software. Furthermore, there are thousands of applications and indicators that can be bought from their marketplace or downloaded freely from the MQL5 codebase. Using these features is pretty easy. To view a graph, right-click on the symbol of the asset of your choice and select “Chart Window”. You can also simply drag the asset symbol onto the background of the interface. Once you have the chart open, you can use the toolbar at the top to apply different graphical objects to the chart (such as a line or an arrow) or drag an indicator onto the chart like mentioned earlier. The resources that can be found and used with MT5 are among the most on any single trading platform. As mentioned earlier, most binary option brokers do not offer any of these features. That is why using MetaTrader 5 to trade binaries can play such an important role in becoming successful. One binary broker that offers MetaTrader 5 is Binary.com. 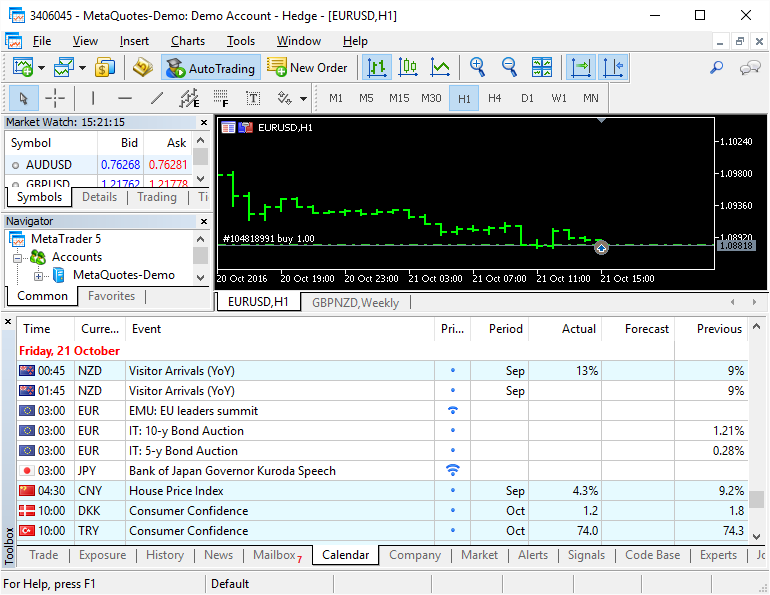 However, you can use a free demo version of MT5 for charting and analysis. Overall, this is a great platform for traders who want to form a complete and profitable strategy. Tools for both technical and fundamental analysis are built into the interface and are easy to use. There is a slight learning curve but the benefits outweigh the time it takes to figure out all of the great features. MT5 is a great resource and one that should be utilized to become a great trader.